Is This The Weirdest Star Trek Item Ever? 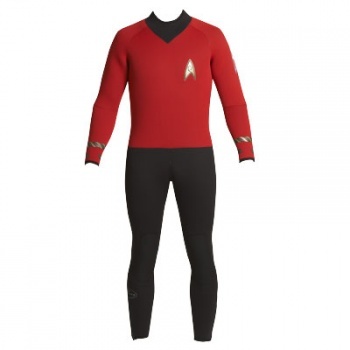 When you think about the original series of Star Trek, scuba diving probably isn't one of the first things that spring to mind, but that hasn't stopped a site from selling Star Trek wetsuits. The Star Trek fandom has a voracious appetite for Merchandise, ranging from figures and models, to technical manuals and dictionaries of fictional languages. Wet suits however, are something of a stretch. Not that that has stopped Roddenberry.com, which gives the whole thing a sort of semi-official seal of approval, from offering a range of custom wetsuits based on the original series, letting you boldly go under the sea, should that be your thing. For around $450 you can get a wetsuit made to measure in 'Command Yellow' or 'Science Blue', letting you play out all your Kirk and/or Spock fantasies; provided of course that those fantasies included tightly fighting rubber suits and lots of water. An 'Engineer Red' suit is also available, but that seems like tempting fate. In the words of Senior Editor Susan Arendt: "[You] may as well just change your name to sharkbait and be done with it"